If your vehicle isn’t looking its best, be it from a fender bender or a hail storm, you can trust the Klamath Falls Honda Body Shop to make it shine again. The service experts at our certified collision center are armed with the latest in auto repair equipment and are ready to take on any job you give us. Large or small, we’re here to get it done quickly—and get it done right. Of course, great tools aren’t worth anything in unskilled hands—luckily, our team has what it takes to use them. We’re confident in our ability to tackle any job, regardless of severity, make, or model, and that still doesn’t stop us from going the extra mile for our customers. Many independent shops around Klamath Falls can’t say the same! We’re recognized and partnered for direct repair with many insurance companies, so our friendly staff is ready to handle your claim without any of the headaches you’ll find elsewhere. Plus, while you’re waiting on your vehicle at our Honda Collision Center, you’ll also have access to our courtesy shuttle for easy transportation. Most importantly, when you do drive off the lot, you’ll have a lifetime warranty on our workmanship for as long as you own the car. Whatever your vehicle’s been through, whatever make and model it may be, our Honda certified body shop is here to help. 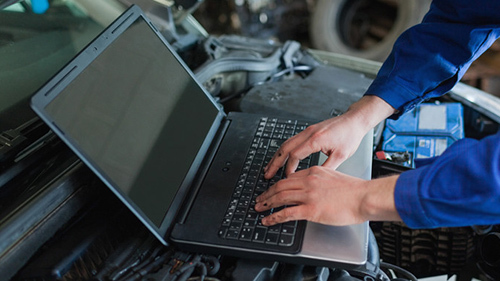 When you’re ready to see just how much of a difference a reliable auto and body shop can make, schedule an appointment online, and let us revitalize your vehicle today!